BeneoPro VWG: naturally sourced for excellent quality. Gluten are a composite of proteins, derived from wheat and used in a wide range of applications. The ability of wheat gluten to form a viscoelastic network when fully hydrated is a unique property compared to other commercially available vegetable proteins. BeneoPro VWG are vital wheat gluten that are naturally produced through milling and separating the vital wheat gluten from the grain, which is then gently dried. With multiple production sites and an international sales network, we ensure a reliable worldwide supply of high quality vital wheat gluten. The majority of consumers believe plant-based proteins to be eco-friendly and healthy. Their carbon footprint is indeed smaller and they contain less fat than meat proteins. Research reflects this trend: the annual global demand for plant-based protein is expected to grow by 43% between 2010 and 2030. Wheat remains the predominant source, especially for bakery wares. BENEO’s wheat protein are a source of essential amino acids which the body cannot produce itself. Apart from their nutritious benefits, they improve the taste and texture of bakery goods, ready-to-eat meals, meat-based products, … Consequently, the sustainable supply has been allocated the IFS label, an acknowledged reference for high quality ingredients. Dough needs to have enough strength to ensure dough tolerance leading to good volume, good oven rise and a nice slice of the final bread. 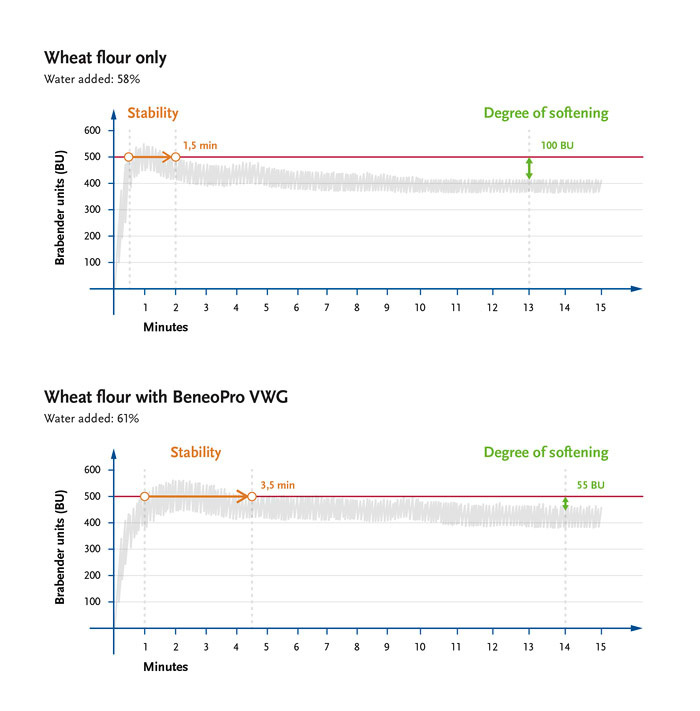 Low-protein flours in baked goods can be fortified with BeneoPro VWG, thus increasing dough strength as well as gas retention and therefore improving texture. With only a small addition of BeneoPro VWG, the flour quality for bakery products can be significantly enhanced. It is recommended in particular for bakery products that require higher protein content. In addition, BeneoPro VWG contributes to the strength of the cereal flakes and reduces the risk of breakage. It also provides proteins allowing for a nutritional and highly popular claim on breakfast cereals. BeneoPro VWG is naturally derived from qualitative non-GMO wheat, sourced in the European Union. The high protein content, as well as the particular protein quality and viscoelastic properties of this IFS-certified ingredient (International Food Standard) are highly valued by our customers. Available in bulk, BigBags, 25-kg bags (on pallets). 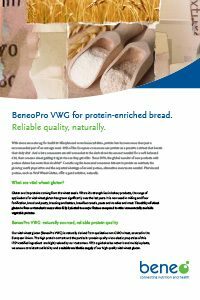 BeneoPro VWG for protein-enriched bread. Protein-enrichment is the next step in bread innovation; already 40% of bread products include protein. Read here how BeneoPro VWG can be easily incorporated in your wholegrain bread. Get to know Vital Wheat Gluten better.